One of my absolute favorite holidays growing up was St. Patrick's Day! My family has a lot of Irish heritage, so I have always loved anything Irish from the shamrocks to the blarney to the folklore about fairies and leprechauns. My mom always made St. Patrick's Day a lot of fun at our house, so this month I thought I would share a few ways to bring some good, clean Irish mischief to your house! Start with breakfast! We didn't usually get cold cereal growing up - much less the really sugary kind, so we always looked forward to a big bowl of Lucky Charms for breakfast! We always knew it was coming, but it was always exciting! 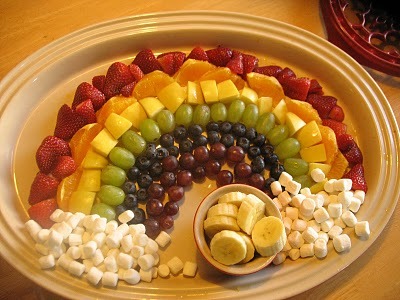 Pair your lucky breakfast with something like a rainbow fruit platter! Use halved strawberries, orange segments, pineapple chunks, green and purple grapes, and blueberries to create a rainbow of color - and nutrition! Don't forget to use sliced bananas for the pot of gold and marshmallow clouds! You can use miniature marshmallows to make the clouds, or use the yummy recipe I have included below using marshmallow cream for a truly decadent dip, just pile it up at the ends of your rainbow! You can, of course, dye your glasses of milk green to add to the Irish feeling of the holiday! This is a delicious fruit dip that will go with just about anything! Combine all ingredients, mixing throughly. Taste and add more spices if necessary. Use as a dip for fresh fruit such as apples, oranges, grapes, and strawberries. For a variation, try omitting the cinnamon and nutmeg and substituting orange peel instead. After school is the time to really make the mischief happen for your family - with a visit from a leprechaun! No, I am not suggesting that you dress up as a leprechaun - you're probably much too tall anyway... 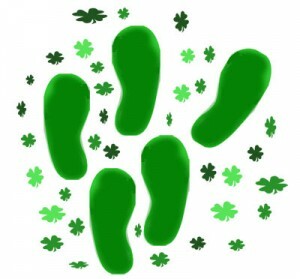 But you can show your family that the leprechauns came to visit and left behind their footprints! Just Click Here to to download a template with footprints that you can print off on green paper - or trace it onto green felt and cut it out - to leave a trail throughout the house. Have the trail wind all through the house, yard, their bedrooms, and have it end with a little treat basket for each person! We always loved following the winding trail of footprints leading us to our own treasure - even if it wasn't really gold! 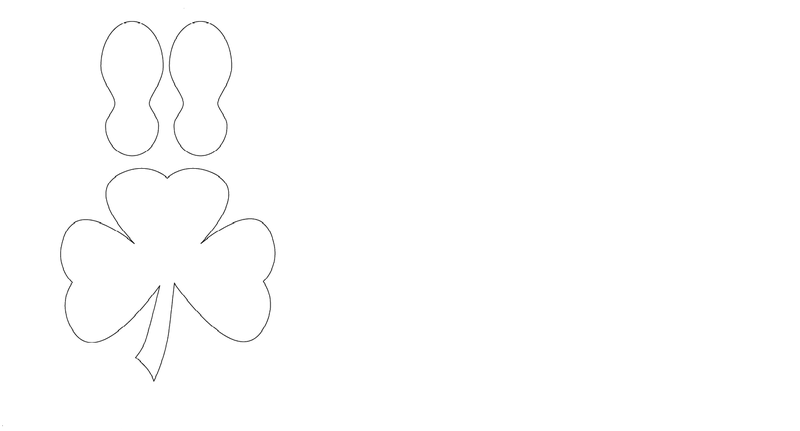 You can also scatter shamrock confetti throughout the trail - showing little traces of their magic that were left behind in their mad dash to bring treats to the house! Treat ideas for the baskets include a bag of chocolate coins, shamrock stickers or jewelry, and the yummy treat recipes I have included below! Rainbow sugar cookies and Lucky Charms marshmallow bars! These are easy to prepare, delicious, and very festive, just what the, um... leprechaun ordered! You can use any colors you would like for these cookies - and you can make as many layers of colors as you want! This can be made using any sugar cookie dough recipe, so feel free to use your favorite. For best results - don't use pre-made sugar cookie dough. 2. In a small bowl, cream together the butter and sugar until smooth. Beat in egg and vanilla. 4. Dye each section the desired color - I used red, yellow, and blue. Mix your dough with the food coloring until the desired color. 5. Decide on the pattern of your colors, and start with the outer arch first. Roll a piece of dough into a "snake" shape, and place on parchment paper on a cookie sheet in an arch shape. Continue using your first color until it is gone or until your cookie sheet is full. Continue the pattern with your next color, and the next, and so on. 6. 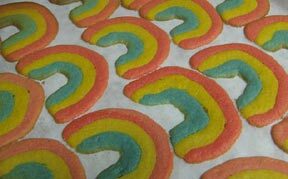 Once all of the rainbows have been constructed, gently press the colors together slightly so that they will stay together while they are baking. 7. Bake 8 to 10 minutes or until golden on the edges. Remove to wire racks to cool. 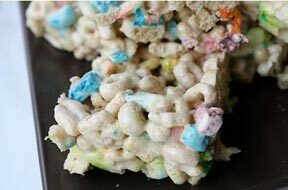 These are a spin off of the traditional Rice Krispies-great for St. Patrick's Day or anytime you want a delicious treat! 1. In a large saucepan over low heat, melt butter and mini marshmallows, stirring constantly. 2. Once melted, pour in cereal and mix until well coated. 3. Press cereal into a greased 9xx13 pan. 4. Allow to cool slightly, then cut into squares and serve. Tip: Use a knife that has a little bit of water on it to prevent the marshmallow bars from sticking to it as you cut.